Perhaps not as superstitious as the American baseball player, the pro cyclist also has their unique superstitions. Whether these routines are to ward off injury in a high casualty sport, or to assure the win, these common and uncommon practices can offer comfort to the athlete. Riders do not like the number thirteen for a race jersey, hotel room, or race date. 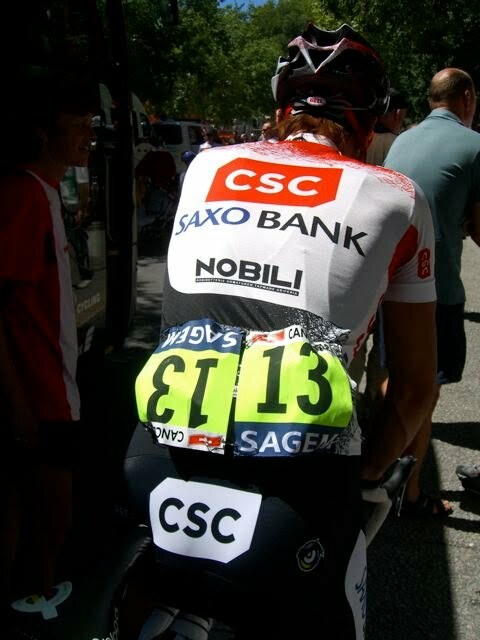 Below Fabian Cancellara shows off the custom of wearing the #13 jersey number upside down and wearing it twice to add up to 8. 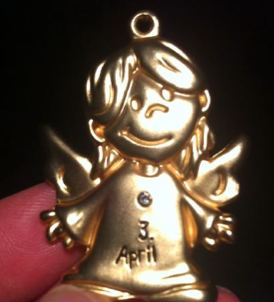 We recently witnessed the same Fabian Cancellara display a small golden angel during his wins at the 2010 Tour of Flanders and 2010 Paris Roubaix. The charm was given to him by his wife to bring him luck, and tucked into his jersey pocket during the length of both races. Luck certainly befell Cancellara in securing a double win, but whether it was due to the token, is hard to say. Many other riders have carried oddities in their pockets including pacifiers, photos, rings, and medals. As a spectator it can be rather entertaining to watch these images on the screen, often leading to a surprise as the camera zooms in, and expressing, "what is that?" and "why is he carrying that?". Some pro riders wear special necklaces or attach charms to their bikes. Chechu Rubiera rode with a small medallion of a religious figure attached to his brake cable. Others wear special undergarments, Nico Mattin was known to wear the same undergarment every day! Some restrict haircuts or shaving. Many of the Italian riders believe that passing the salt at the dinner table will bring the rider back luck. The container of salt should be placed on the table, instead of passed from hand to hand. If spilt, the salt should immediately be tossed over the left shoulder (this is to ward off the Devil, who aroused by the spilling of the salt, is now standing behind the left shoulder). Many racers (especially true with the Italian and Spanish riders) say a quick prayer at the start line before the race begins. We also commonly see the sign of the cross displayed at the finish line of a race as a thanks, followed by looking upward to the skies. Pre race rituals often dictate what a cyclist will eat, when they eat, how they dress, how they spend their time in preparation, and the order of tasks before a race. Lance Armstrong is reported to be superstitious about starting and finishing on the same bike. In the years that he wore the yellow jersey during the Tour de France, Lance would not wear a matching all yellow helmet until the last day of the tour, fearing that his luck would change. I personally always get on my bike from the left side, always offer the sign of the cross in prayer for the other person when I see an ambulance, always pump my tires each time before I ride, and I wear the same silver necklace when I ride a bike. The necklace holds a pendant with the celtic symbol for Luck. If you asked me if I was superstitious I would say, "not really". Not really? How about you?